Full Size Legend of Zelda Link's Master Sword with Plaque. Blade: 27" Handle: 5" Overall: 38 Weight: 3.5 lbs. Unsharpened stainless steel blade with engravings. Rubberized handle with faux jewel on metal guard. Popular for any Zelda fan! Brand new, recently released from manufacturers. 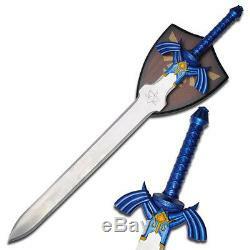 This is a redesigned Zelda Twilight Master Princess Sword with fully blue handle. Features a full thick blade, unsharpened (perfect for display and cosplay) and made of 440 stainless steel. Complete with Trifoce seal engraving on both sides. The two horns protruding appears as if it evolved from the handle of the sword! The handle itself is made of hard plastic with crossover grip. On base of the handle, where it meets the sword, there is the well-known intricate golden design to remind you of its fantasy origin. This is a must have for all Zelda fans! This is a very nice master sword, the blade looks perfect, it is quite large and heavy. We reserve the right to cancel any order. We are not responsible for undeliverable addresses. We will always work to resolve any problems or issues. The item "Link Master Sword Zelda Twilight Princess Fantasy Sword with Plaque Blue legend" is in sale since Wednesday, July 8, 2015. This item is in the category "Collectibles\Knives, Swords & Blades\TV, Film & Game Replica Blades". The seller is "modern_markets" and is located in Continental. This item can be shipped to United States, Canada, Australia, Taiwan, Thailand, Hong Kong, Mexico, Philippines, Norway, Qatar, Kuwait, Bahrain, Bahamas, Viet nam.